Helen Mayberg found the switch that lifts depression in area 25, a spot deep in the cortex. 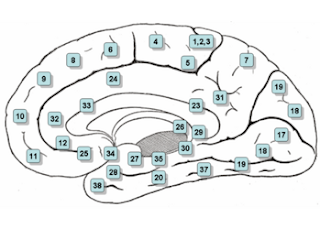 This area is the key conduit of neural traffic between the thinking frontal cortex or forebrain and the central limbic region that plays a role in emotions and which appeared earlier in our evolutionary development. This area is overactive during depression or sadness. “Like a gate left open” she says. In contrast to this area both the frontal cortex and limbic region were less active as discovered with positron-emission tomography (PET)in depressed patients with Parkinson’s disease compared to not depressed patients with this neurological disorder. Area 25 was also hyperactive in depressed patients without neurological disease. Patients that recovered form depression showed a rise in frontal activity and a calming in area 25. Area 25 also dampened when depressed patients responded to cognitive therapy. The whole story from the discovery of the relation between area 25 and depression to Deep Brain Stimulation (DBS) is told in a very readable chapter of the book: Best of the Brain from Scientific American, Mind, Matter, and Tomorrow’s brain. Received this excellent book just a few days ago and read two chapters already in bed before going to sleep. I even finished the chapters before falling a sleep, that’s a remarkable quality of the writers, usually it takes 10 minutes before I fall a sleep. I am very enthusiastic about this book so I had to tell you this story before reading the whole book and writing a complete review. Anyone with interest in the brain and results of recent research should read this book. It is easy to read. For the table of content please see The Dana Foundation. The Dana Foundation is a private philanthropy with principal interests in brain science, immunology, and arts education. Now back to the discovery of area 25 and DBS. With a group of researcher at the University of Toronto they sought a way to return the area back to normal activity. The group decided to try inserting electrodes in area 25 in a dozen severely depressed patients that had not responded to several antidepressants and ECT. A pair of electrodes and slender leads were slid in to area 25 after drilling a pair of nickel-size holes in the skull. A pacemaker was attached to the leads and placed under the collarbone. After turning the pacemaker on two thirds of the patients were completely recovered, never felt better. Not only was there a new cure found for severely depressed patients not responding to the usual treatment but also our way of thinking about the brain has changed. The brain works as a system of coordinated functions that arise from different regions, rather than as a single unit. The chapter holds even more background information and interesting results with cognitive behavioural therapy and brain imaging, go get it. Were is Depression Located in the Brain? 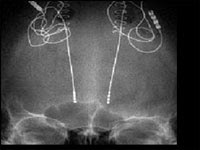 In deep brain stimulation, or DBS, an implanted electrical device sends symptom-suppressing pulses to a selected brain target. DBS is approved for use in three neurological ailments — essential tremor, Parkinson’s Disease, and dystonia — and is being tested in others. Among these are treatment-resistant forms of three psychiatric or psychiatric-like conditions: depression, obsessive-compulsive disorder, and Tourette Syndrome. Our speaker will be neurosurgeon Ron Alterman, who earned a medical degree at New York’s Albert Einstein College of Medicine. After stints on the faculties of three medical schools, Dr. Alterman now teaches at Mount Sinai. There, he supervises the program which includes DBS.